Our cedar split rail fencing has multiple purposes aside from being a beautiful addition to your property. This robust fence defines your property lines, contains livestock including horses, and works as a great aesthetic touch. At Rustic Fence, we always use the highest quality cedar to ensure a very long lifespan and immense durability. With over 50 years of experience, we produce split rail fences that are built to last through any weather or great force. We craft our rails so that they can stand strong in your yard for years to come. Our professional and licensed team will then install your fence with expert precision to ensure that none of your lawn or property is damaged during the process. 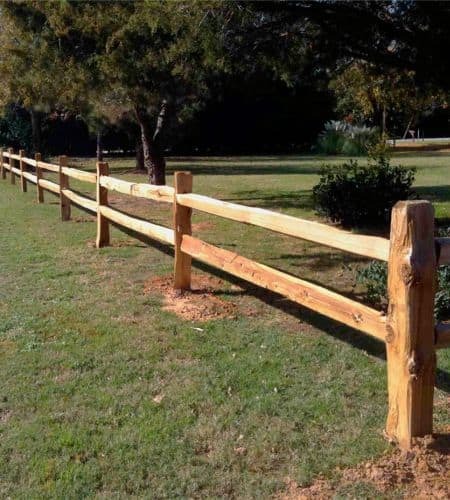 With a long-lasting warranty plus exceptional customer service, we work hard to ensure that you are completely satisfied with your new split rail fence. We take great pride in what we do, and we’re not satisfied until you are. Contact us today for a free estimate plus more information about our split rail fencing.